Newly re-furbished Pizza Hut Restaurant at the Meadowhall Retail Park in Sheffield. Pizza Hut Restaurants has unveiled a £276,300 restaurant makeover at its Sheffield Retail Park Hut, creating 10 new jobs for the area. The re-opening is part of a multi-million pound nationwide redesign programme by the casual dining company and forms part of its wider refurbishment programme across Sheffield where investment totals £672,300, creating 40 jobs. A brand new, exciting menu will also be rolled out in the revamped Hut that includes the new Ultimate Thin pizza – featuring Pizza Hut’s thinnest ever crust – Kentucky style BBQ ribs, frickles (fried pickles) and sweet potato fries. 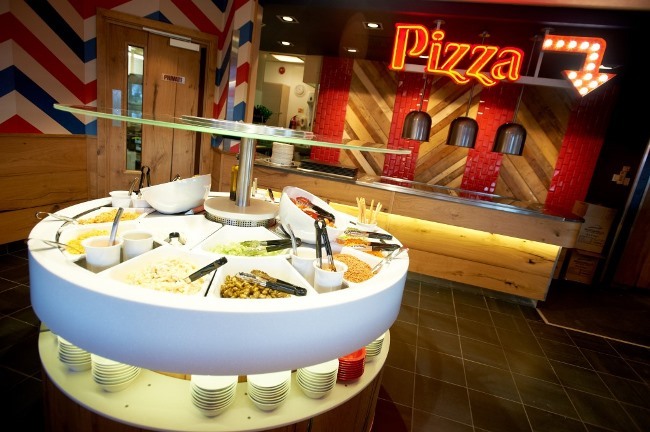 All of Pizza Hut Restaurants’ famous icons – including the Ice Cream Factory, Salad Station and Buffet – still take centre stage, but form part of the new, interactive design that includes a central preparation station offering a range of desserts including warm cookie dough, and a self-service soft drinks hub allowing guests to refill drinks at their leisure. Restaurant manager Kerry Thompson said: “We are excited to re-open our doors and show off our fantastic new look Hut and hope guests enjoy the vibrant and modern feel to the restaurant as much as we do. The redesigned restaurant provides a more open and inviting dining space for customers along with improved lighting schemes, showcasing the fresh food and vibrant atmosphere in the Hut. The investment in Sheffield is part of a broader £60 million refurbishment and restructuring programme for the business, secured through private equity investment from Rutland Partners in late 2012.